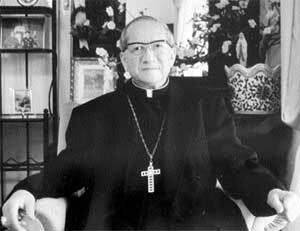 During Pope John Paul II’s Spiritual Exercises in March 2000, Vietnamese Archbishop Francois Xavier Nguyen Van Thuân preached on the Eucharist with stories from his 13 years in prison at the hands of the communists. The former archbishop of Saigon explained that when he was arrested, he was not permitted to take any of his personal belongings. But the following day he was allowed to write his family to request essentials like clothes and toothpaste. He wrote, “Please send me some wine as medication for my stomach problems.” His family understood immediately what he wanted, and they sent him a small bottle labeled “Medicine for Stomach Ache.” They also concealed some hosts among his clothes.